All external links will open in a new browser window. Whiskey Stills, Inc. This is a community group operating in around Whiskey Creek, Nirranda and Curdievale in South Western Victoria, established to publicise the history of the reigon with reference to the Whiskey Stills! "We aim to preserve and promote the stories and myths eminating from early life of the settlers of the south western coastal region running along the Curdies River basin of Victoria. In particular, we are focussing on the period of the late 1800s." Timboon Railway Shed Distillery - The owners of ' Timboon Fine Ice Cream' at the Timboon Railway Shed, Tim Marwood and Caroline Simmons, eager to attract visitors all year round and not just at summer for ice cream indulging, investigated the history of illicit distilling in the area and determined to include a small distillery, adding value to the visitor experience. 1947 Federation Handicap 2nd place C.P. Delaney. History Of Settlement, South West Victoria - Some background information of the area. www.twomileborris.com - this is THE Twomileborris community website. The guestbook is well worth the price of admission, just don't read whilst operating heavy machinery. The cow of the month has given some Western Victorians ideas ... for a friendly competition. IGPT County Tipperary Genealogy Project - loads of Tipperarary-specific information here covering all sorts of records. Linked with the CMC below. The Ireland CMC Genealogy Record Project - loads of info here covering all sorts of records - Christening/Birth, Marriage, Death, Cemetery, Griffith's Index and Property owner records. Well worth the visit for researchers. The Great Irish Famine - "Approved by the New Jersey Commission on Holocaust Education on September 10th, 1996, for inclusion in the Holocaust and Genocide Curriculum at the secondary level" - chilling to hear the Famine classified with Holocaust & Genocide. The Irish Potato Famine - a Prince Edward Island (Canada) Dept of Agriculture and Forestry site that discusses the famine as part of the story of the potato. While the potato was just the last in a long line of factors causing the Famine, it is nonetheless interesting to read why it was a staple food in Ireland. 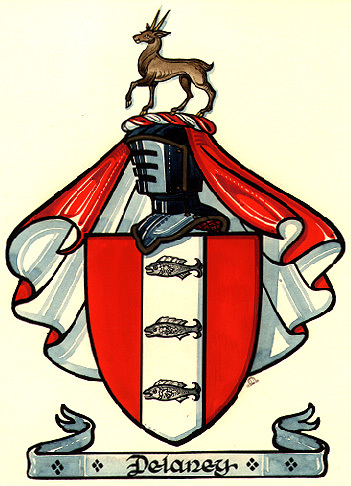 The Delaney Family Coat of Arms - here's a scan of the commonly-seen 'Delaney coat of arms'. What makes me wonder is: after reading all about the trials and tribulations that the Irish went through at the hands of the English to keep them poor and downtrodden, how did they end up with a coat of arms, the very sign of nobility?? Couldn't even afford the coat let alone the arms. This 'coat of arms' was bought back by a relative of mine from a trip to Ireland. I also remember my father was able to buy a tie with the deer's head crest on it. Delaney Family Genealogy Forum - they're everywhere!! Glenn Raudins' site - Glenn has republished The Complete Practical Distiller , the book used by the Delaneys when making their Mountain Dew whiskey, using modern materials. Interactive Land Channel Maps of Victoria - Official Victorian Government site with interactive maps to see where the Delaneys were and are! The National Trust file No. L10268 / Name of Place: NIRRANDA COAST - National Trust report on the history and significance of the coastline near Nirranda. "The Nirranda Coast is significant at a State level for aesthetic, archaeological, cultural, and scientific (geological and geomorphological) reasons. It is significant at a Regional level for flora and fauna and for educational purposes." GED2HTML data structure interpreting GEDCOM 5.5 with reference to usage by FTW 8.0 - Another researcher's notes on how to integrate FTM GEDCOM v5.5 files with GED2HTML 3.6.